HES Med Terminals is based in Fos-sur-Mer, along the French Mediterranean coast and situated at the main waterway of France, the Rhone-Delta river. 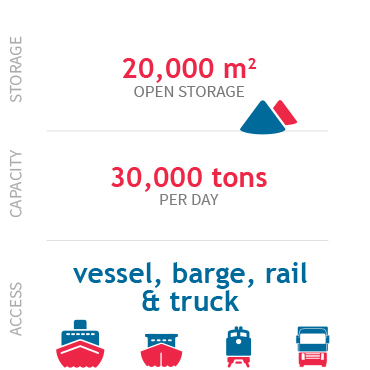 Its unique port in the Mediterranean offers inland transportation by sea, river, road and rail. Due to the exceptional geographical location, the terminal is an ideal hub for Europe, North Africa and the Asian shipping routes. The stevedoring company is specialized in heavy lift cargo and the handling and storage of steel products as well as dry bulk cargo. The three terminals (dry bulk, steel products and breakbulk) make this company a key player. Having grown steadily since 1973, the terminal provides dedicated equipment for breakbulk services.